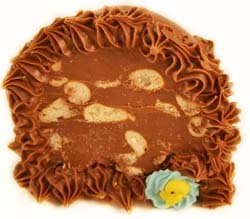 The center of this egg is Dorothy's melt away is a smooth, creamery chocolate -- like a large truffle -- jammed with pretzel pieces to give it crunch and a kick of salt. Hugely popular! From Julie of New Alexandria, Pennsylvania on 4/1/2018 . From NMOLS of The Villages, Florida on 3/27/2015 .